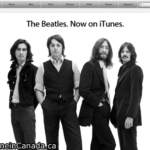 So, big announcement by Apple today that The Beatles are finally available on iTunes. Anyone pull the trigger and purchase song or albums today? Yesterday Apple’s website said “Tomorrow is just another day”. They weren’t lying, really. Because this video below makes it all worth it, right? RIGHT?! In other news, mullets are awesome. When Apple replaces the homepage of their website with a cryptic message about ‘a day you’ll never forget’, expectations are set. People are thinking of something ‘revolutionary’, such as some sort of iTunes cloud feature, or the release of iOS 4.2. However, Apple, as the marketing juggernaut played this well like a fiddle. Steve Jobs and The Beatles must be pretty happy right about now. I won’t forget this day because Apple made the Internet angry.